The Historical GIS primarily maps out the Quit Rent Office version of the Books of Survey and Distribution, with all their imperfections. It is not a definitive source on 17th-century Irish townlands. Overlaying 17th-century townlands onto 19th-century Ordinance Survey maps or Google maps is a challenging task. The process is ongoing and we really appreciate the feedback we have already received from a variety of sources. Unfortunately, due to the sheer volume of correspondence we have received, it will not be possible to reply to each email. The Down Survey GIS consists of three main components; database, maps and user interface. Information is stored in a MySQL database utilising the spatial datatype accessed by a companion application programming interface (API). Data relating to each townland is stored, including all of the information mentioned in the 17th Century sources. Additionally, townlands are uniquely associated with a parish, which is in turn associated with a Barony, and finally a County. Modelling the data in this way enables analysis at each geographic level. The map utilised is Google Maps, with custom generated overlays of the Ordnance Survey and Down Survey. The overlays were tiled at multiple zoom levels to transfer efficiently views to users at each level of granularity. The map shows the selected elements of the GIS to the user, e.g. 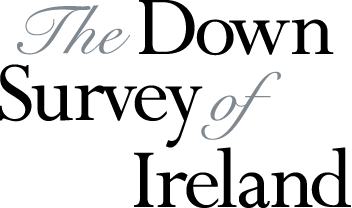 individual landowners or buildings surveyed as part of the Down Survey. Controls have been designed to enable the user to alter the elements on the map as discussed above. The controls trigger AJAX calls to the API to access specific data. Each API call is stateless to maintain a consistent RESTful API, however, the client-side browser maintains the state of the current session. A URL is generated based on the map the user is viewing, the state is stored as part of that URL. States that are stored include the zoom level of the map, the centre of the map, the opacity level of both overlays, which landowners are visible, and the change in land ownership view. A user returning to a specific URL will cause the map to be reloaded to the exact same location, zoom and control setting with the map showing identical information. All data is loaded dynamically as needed based on the selections the user has made and the viewport of the map. This reduces the amount of information loaded by the browser at initial page load as well as the amount of data loaded on each AJAX call when a user makes a selection. In the event of a map pan or zoom out, the query to the API only requests the information for the newly visibly areas of the map. If a user zooms in no new query is made with one exception: if the user has zoomed close enough the map will now load individual townland polygons; these polygons are not loaded at a far out zoom due to bandwidth restrictions. By structuring the data in this way we are now able to relate our data to the existing corpus of historical GIS using 17th Century, Ordnance Survey or LATLONG spatial coordinates.